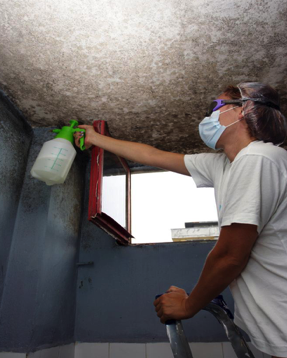 Mold is a natural product to help organic matter to decompose and go back into the environment and while it causes us problems there is no way to rid yourself completely of mold. With that said there are some simple ways to prevent it from reappearing in your home. Mold only takes hold and grows in damp areas this is why you usually see it in your bathroom and basement. Make sure to keep these areas are as dry as possible. In the bathrooms dry the shower and bath areas after each use, check your faucets and fixtures for leaks fixing or replacing those items as needed. If you see water spots on your walls or your floors are always damp you may have a leaky water or drain pipe that is allowing water to seep under the drywall or flooring. By fixing these leaks not only will they stop the mold but will save you money on your water bill. You will also want to get a fan for the bathroom this will pull the moisture out of the bathroom. If you have a damp basement you can buy a product to place in the basement to collect the dampness, install a sump pump or a de-humidifier depending on the reason for the dampness. A de-humidifier if large enough can pull enough humidity out of the room to keep it between 30% and 50% keeping the mold from growing. Be vigilant and do a monthly check of all your pipes, basement, around the outside foundation to make sure there are no cracks if there are fix them right away. The quickest way to know you have a problem is if you see rusty pipes or condensation. If you do have to tear down a wall to repair pipes behind the wall make sure the replacement drywall is green board this is mold resistant board and you can buy a mold resistant paint as well. Depending on the amount of mold you might have to go over it several times before you are completely rid of it, but once you can no longer smell the mold or are not affected by it then you know it is completely gone.